I'm out of state, can I ship my parts to a Jet-Hot location? Thousands of people like you send us their parts each year. To find out which location you should send to, give us a call at (800) 432-3379 or email sales@jet-hot.com. Concerned about shipping damage? Read our recommended packing guide here. My parts are rusted, can I still get them Jet-Hotted? More often than not, we receive exhaust parts that are already rusted. Over the past 35 years we have developed a superior process for prepping and coating parts. If your parts contain pits or holes, or if you're concerned about their condition prior to coating, call us and one of our coatings experts will advise you on how best to proceed. Our goal is to get your parts back to you in perfect condition as fast as possible. We will ship your parts back within an estimated 15 business days. We will do our best to get them out to you sooner, but this is the current turn around time. If you are in a hurry we offer RUSH orders with a 5-business day polish turn time and a 7-business day color turn time. Rush orders incur a 25% rush order fee. We can even EXPEDITE orders for the fastest possible turn around: 3-business days for polish and 5-business days for color. These orders are subject to a 50% charge. DO YOU COAT INSIDE AND OUT? How do I get rid of oil stains? A little elbow grease and the right medium. If the stain is mild, first try using a clean rag and aluminum polish (like that guy to the right). If that doesn’t work try very fine steel wool using light circular motions. Next, try a red Scotch-brite pad with the same method. Finally, if neither of those work you can try a very fine wet sand paper. Aren't all ceramic coatings the same? No. In 1981 Jet-Hot pioneered the Classic Polish Ceramic Coating. Back then, it was cutting-edge technology. Today, it's still the industry's leading ceramic coating and first--and only--choice of professional race car drivers. Imitators are everywhere, but only one company stands by each and every coating with a lifetime guarantee. Still think all ceramic coatings are the same? Almost 30% of the parts we receive are requests to re-coat after other coatings have failed. So you can send your parts to Jet-Hot the first time, and it'll be the last. We guarantee it. My local guy says he uses Jet-Hot coating. No one offers Jet-Hot Coatings. Period. The way the coating is applied is just as--if not more than--important as the coating itself. Jet-Hot follows a time-proven process to deliver the ultimate in thermal and corrosion management. Our 650-degree ovens remove oil and grease, preparing your part for Jet-Hot's customized surface preparation process. Parts are blasted with high-purity aluminum oxide, creating a surface profile optimized for maximum coating adhesion. Jet-Hot's trusted proprietary formula is applied in two layers to deliver the durability, thickness, and bond-strength required to upgrade your parts with Jet-Hot's legendary performance protection. 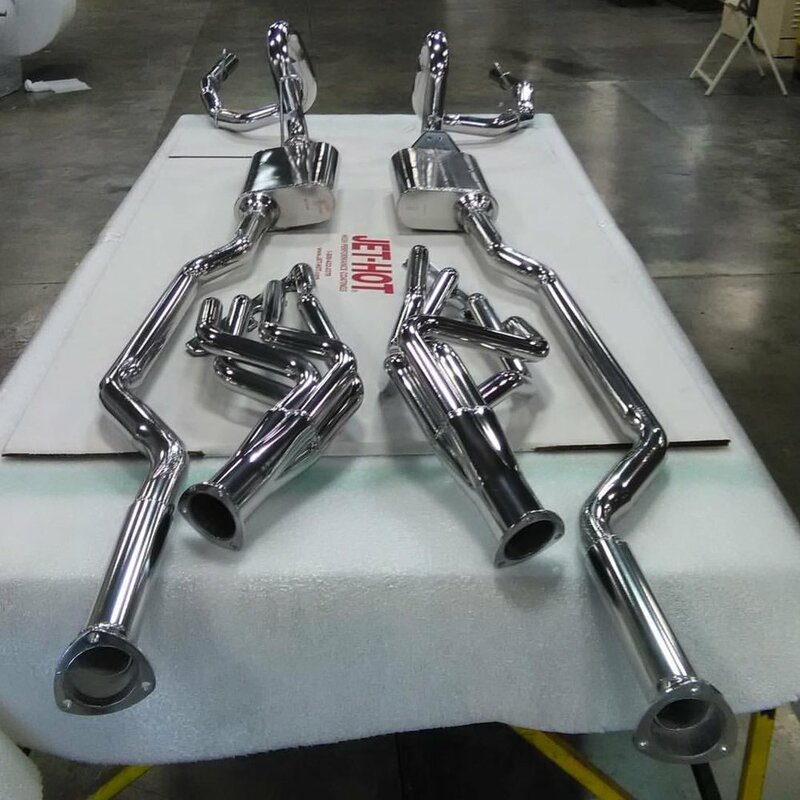 Once coated with Jet-Hot's engineered coating, your parts will perform better than ever. I've heard Swaintech is the way to go? Swaintech does have a great product. They offer one coating type. It's comparable to Jet-Hot's 2500 offering. This level of coating is the most expensive on the market, and is only appropriate for about 10% of customers. That's why Jet-Hot provides 3 different coating offerings, not one. So you'll get a more custom coating to fit your parts and never overpay. Additionally, Swaintech only comes in one color. Jet-Hot offer over 65 color choices. Why sacrifice looks for performance when you can have both? Looking for something that's truly one-of-a-kind? Jet-Hot's coatings specialists can even handle your custom design requests. Make your next project extraordinary. Does JET-HOT Offer a Warranty or Guarantee? All Jet-Hot Coatings come with a 100% LIFETIME Guarantee. If your Jet-Hot coating fails, we will re-coat the part absolutely free. We guarantee that our coatings will perform as promised. How Much Does Jet-Hot Ceramic Coating Cost? Not as much as you might think. But don’t take our word for it. Get a customized estimate for your parts in under 60 seconds. What are the Benefits of Ceramic Coatings? Ceramic coatings prevent discoloration, corrosion, and oxidation. Ceramic coatings provide the highest quality in thermal management available today. For automotive applications specifically, ceramic coatings improve vehicle performance and extend the life of your vehicle's coated and non-coated components. How Should I Ship My Parts? Should I Coat My Headers? If you want to increase your vehicle's performance, extend the life of your headers and non-coated surrounding parts, and look showroom-ready under the hood all with a 100% Lifetime guarantee, then YES! First, Jet-Hot applies its coatings to both the inside and outside of your parts to maximize heat control and durability. Jet-Hot also has multiple coating options for different applications with various thermal thresholds, so you can be sure you're getting the product matched perfectly to your vehicle and how you use it. Jet-Hot also has multiple coating options so you can get the product that is right for your vehicle. And you'll never have to sacrifice looks for performance because Jet-Hot coatings are available in 65+ color options, so your vehicle can look as good as it performs—all with Jet-Hot's 100% Lifetime Guarantee. Is Jet-Hot Really Worth It? Why spend hundreds or thousands on new exhaust components only to have them look terrible months after installation? Why leave horsepower on the table? When you show your vehicle, do people say WOW? What about when you lift the hood? For about the cost of two new tires, Jet-Hot can make sure your parts always perform their best and look great—and we guarantee it for life!